It is now 40 years since Brandon Carter began thinking about how the preconditions necessary for human existence might bias the view we have of the Universe. Carter showed that fairly simple changes to the laws of the Physics yield Universes which are too simple to allow the emergence of life. For example, you can’t even alter the number of spatial dimensions since planetary orbits are only stable in three dimensions. Our Universe seems to exhibit quite a few examples of such fine-tuning and many of these are discussed in Paul Davies’s book. One way to explain these coincidences is to propose that there are many “Universes” and that, naturally, we find ourselves living in one of the, presumably very rare, Universes that just happens to be life-friendly. This idea is called cosmological anthropic selection. Until 25 years ago such speculations were little more than amusing parlour games for science over-achievers but this changed with the development of inflationary theories of the early Universe. Inflation, the idea that the very early Universe went through a brief epoch of exponential growth, was initially proposed as way of explaining observed properties of the Universe we actually live in. However, some versions of inflation predicted a Universe which spontaneously separated into many huge domains within each of which the laws of nature might differ. Anthropic selection started to become at least a little more respectable. Over the same 25 year period, there have been a number of books dedicated to explaining these ideas. Barrow & Tipler’s The Anthropic Cosmological Principle (1986) was perhaps the most exhaustive (and exhausting!) whilst Martin Rees’s Just Six Numbers (1999) was probably the most successful as a genuine popularization. In 2006 there seems to have been quite a spate of such books with Leo Susskind, Alex Vilenkin and Paul Davies all bringing out popular (or semi-popular) accounts and even Richard Dawkins getting in on the act with several pages on the topic in his, deliberately notorious, The God Delusion. Davies covers similar ground to Rees and at much the same level but his treatment is, of course, a little more up to date and also goes more deeply into philosophical matters. Early chapters cover basic cosmology with discussions of the Big Bang, particle physics and recent revelations concerning dark matter and dark energy. He then moves onto the heart of the book, the discussion of the apparent fine-tuning of our Universe to make it fit for life. Davies then considers whether this is best explained by anthropic selection in a multiverse or by “Intelligent Design”. Whilst rghtly dismissive of intelligent design, Davies elegantly points out that “a multiverse is not a complete explanation of existence, because it still requires some uexplained physical laws”. The book finishes with, to me, a rather unsatisfying attempt to cast the Universe as “self-explanatory” by which he seems to mean that a Universe containing observers can bring itself into being. I have to admit that I utterly failed to grasp what this means! So, how does the Davies book stack up against the rest of the anthropic-selection pack? 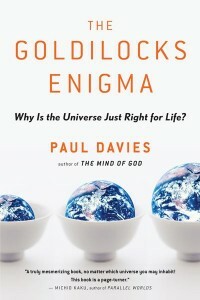 Paul Davies is, of course, a very experienced pop-science writer and this shows in the easy readability and clear focus of The Goldilocks Enigma. Quite simply, apart from the obscure last chapter, The Goldilocks Enigma is a very good read. If you’ve never read a book on cosmological anthropic selection before then, assuming you’re not an expert in string theory, the Davies book is certainly the best one to start with. If, on the other hand, you’re already familiar with anthropic ideas then you’re unlikely to learn much from Davies’s treatment.